ANCHORAGE, Alaska— Arctic ringed seals threatened by climate change today received proposed protections for more than 226 million acres of critical habitat in Alaska’s Bering, Chukchi and Beaufort seas. Ringed seals were listed as threatened under the Endangered Species Act in 2012 as a result of a Center for Biological Diversity petition. Today’s critical habitat proposal from the National Marine Fisheries Service would be the largest such designation in history, protecting more than 350,000 square miles, an area more than twice the size of California. Photo courtesy National Marine Mammal Laboratory, NOAA. Photos are available for media use. Ringed seals, which are the primary food for polar bears, excavate snow caves on top of sea ice to create protected shelters for nursing pups. As the Arctic warms, the sea ice is breaking up earlier, and rain is falling on snow, causing snow caves to collapse and leading to the deaths of pups. This year’s summer sea ice reached its sixth lowest level on record; the lowest level was recorded in 2012, when the sea ice only reached half its average size. Scientists predict that the Arctic could be ice-free in summer before mid-century. At the same time, oil giant Shell continues to press for drilling in ringed seal habitat. Critical habitat provides key protections for listed species by prohibiting federal agencies from permitting, funding, or carrying out actions that “adversely modify” designated areas. Species with designated critical habitat are twice as likely to be recovering as those without. 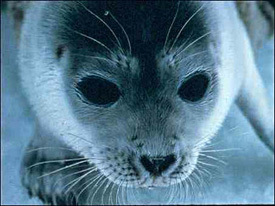 Ringed and bearded seals were listed as threatened under the Endangered Species Act in December 2012 after the Center’s 2008 petition to the National Marine Fisheries Service. Bearded seals lost their Endangered Species Act protection in a decision that the Center is currently appealing in the 9th Circuit Court of Appeals. Following today’s proposal, the Fisheries Service will finalize its critical habitat designation by December 2015. The critical habitat designation will not affect Alaska natives’ subsistence harvest, which is exempted generally from the Act’s prohibitions. « Last chance to protect Knowland Park!